Two campaign medals with ribbons for the 1914-1918 war inscribed "2 Lieutenant R. Mitchell". 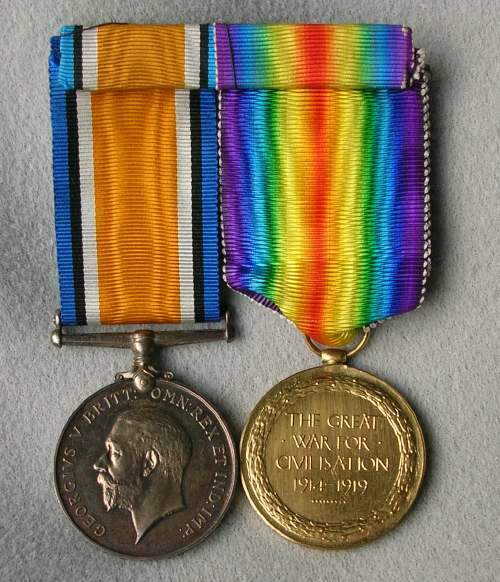 One medal is gold-coloured and inscribed "The Great War for Civilisation" with angel on obverse side (rainbow coloured ribbon), the other has the head of King George Vth. and horseman on obverse side (blue,black, white and orange striped ribbon). Came from box of material from Grant family. I have one of those coins. #181177 with a name and SPR It was from my Mums old stuff. I have no idea how she got it or anything about it. could you help me? They are not coins but campaign medals from the First World War. The one on the left is the British War Medal 1914-18 awarded to officers and men of the British Imperial Forces who entered a theatre of war or service overseas between 05/08/1914 and 11/11/1918. Approx 6.5 million were issued in silver and bronze. The front depicts head of George V with the recipient’s service number, rank, name and unit was impressed on rim, so you should be able to find out who the medal was issued to. The bronze medals, one of which is shown here, were issued mainly to Chinese, Maltese and Indian Labour Corps.